필자는 지난 십 수년간 미 해병협회 잡지(Magazine of the Marines “Leatherneck”)을 구독해오고 있습니다. 2017년 2월호를 훑어보다가 한눈에 들어오는 반가운 기사를 발견했습니다. 바로 우리 청룡부대가 1967년 베트남 참전 중 이룩했던 짜빈동 전투 신화에 대한 상보(24-28 페이지)였습니다. 필자는 지난 2003년 인터넷에 실린 짜빈동 전투기록을 영문으로 번역하여 월남참전 전우 홈페이지에 게재한바 있습니다. 그래서 그런지 기사를 발견한 순간 대단히 반갑고 한편 자부심을 느끼기도 했습니다. 이 짜빈동 전투의 상보는 동아시아담당 미 해병 정보장교로 근무했던 미 해병대 예비역 중령인 James F. Durand씨가 기고한글입니다. 소개 글 중에는 짜빈동 전투 당시 청룡 3대대 11중대 장 정경진 대위, 1소대장 신원배소위 그리고 관측장교 김세창 중위에 대한 얘기가 소상히 기록되어 있습니다. 특히 관측장교 김세창 중위가 적 저격병으로부터 공격받았을 때의 상황도 설명하고 있습니다. 자랑스러운 대한민국 해병대의 영원히 빛나는 전승기록이기에 이에 소개 드리며 상보를 5 페이지에 걸쳐 전통을 자랑하는 미 해병협회 잡지에 기고해주신 제임스 듀런드씨에게 높은 경의와 감사를 표합니다. 감사합니다. 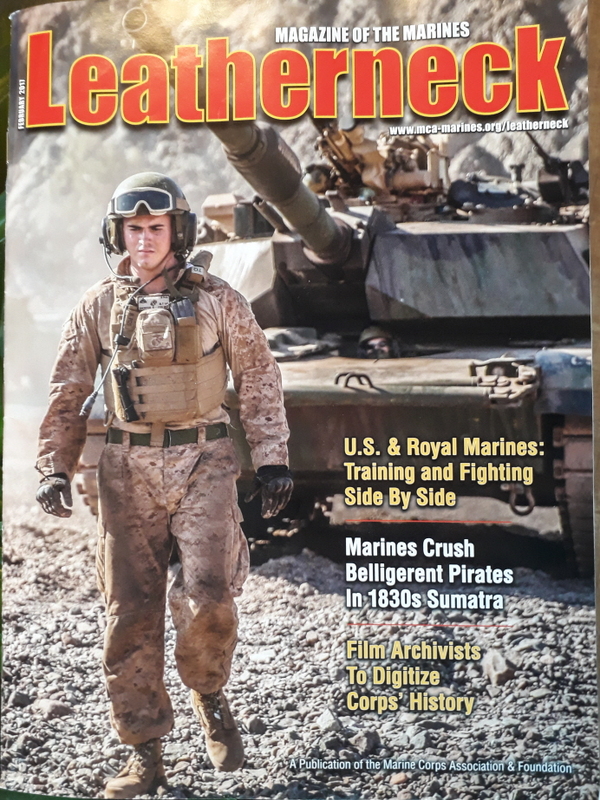 I have subscribed to the US Marine magazine “Leatherneck” for 15 years. 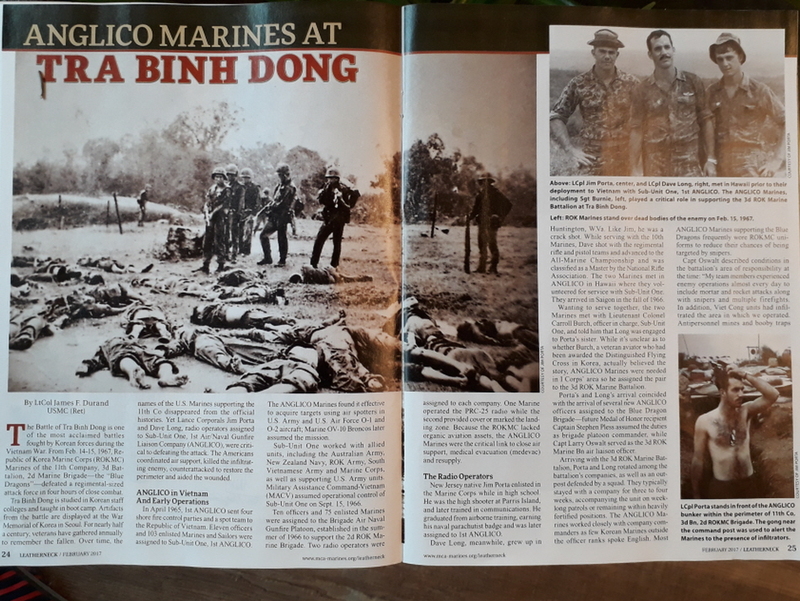 When I glanced over the magazine of the February issue, with pleasure I found a remarkable report on Tra Binh Dong operation conducted by the ROKMC, the 11th company ,3rd Battalion, 2nd Marine Brigade(Blue Dragons) from February 14-15, 1967 in Vietnam. About 16 years ago I translated the ROKMC’s TRA Binh Dong combat story in English and posted it in a ROK Vietnam War veteran’s website. For this reason, I was particularly pleased to find the article posted in the magazine. 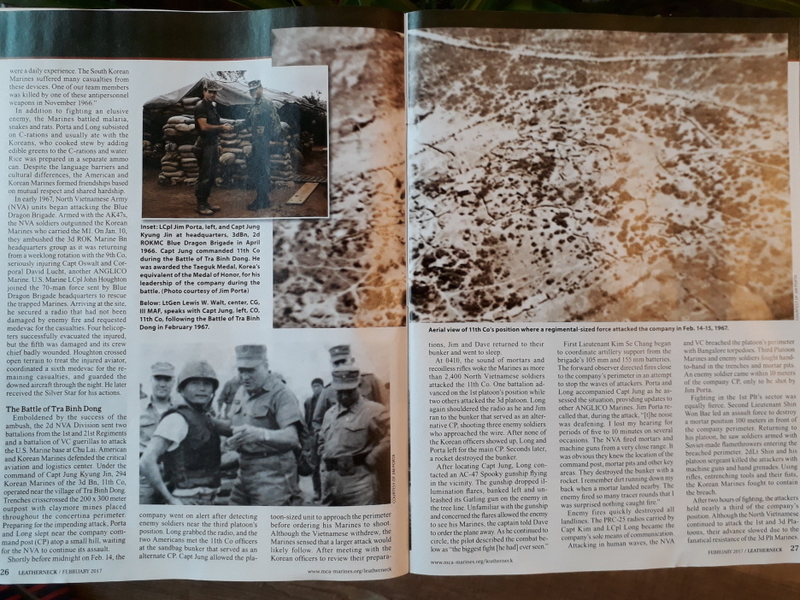 The detailed report on the Tra Binh Dong battle was written and posted under the title of “ANGLICO MARINES AT TRA BINH DONG” by Mr. James F. Durand, a retired USMC LTC, who served as an intelligence and East Asia Area Officer. In the introduction Mr. Durand explained stories in detail especially on 11th company commander, Capt. Jung Kyung-jin, 1st platoon leader 2nd Lt Shin Won-bae and the Forward Officer,1st Lt Kim Se-chang. 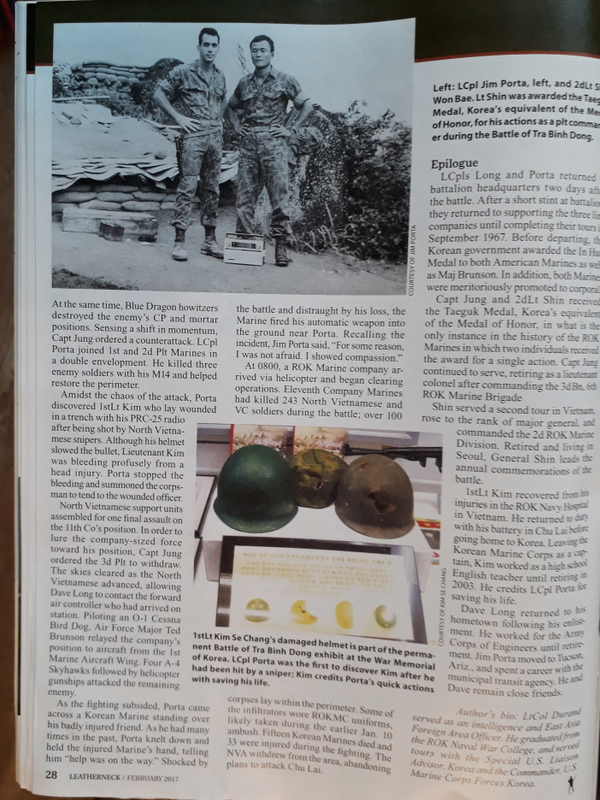 The report included a situational story about enemy sniper’s attack that had hit FO 1st lt Kim’s helmet. As it has been one of the most acclaimed victorious battles carried out by the ROK forces during the Vietnam War, I am pleased to introduce here. At the same time I would like to express my sincere respect to Colonel Duran’s brilliant achievement that has widely spread ROKMC’s gallantry and the amicable comradeship between the two Marines the ROK and the United States of America.